When enabled, this option will display notifications in your store front. Disabling this option will prevent the notifications from being displayed. When enabled, notifications will be displayed on mobile devices. Disable this option if you do not want notifications to be displayed on mobile devices. When enabled, notifications will be displayed on desktop and tablet devices. Disable this option if you do not want notifications to be displayed on tablet or desktop devices. When enabled and all recent order notifications have been displayed, the notifications will repeat again from the beginning. Each time a new page is loaded, the notifications will resume following the last notification except when a new order or review has been published as these are always prioritized. The index of the notification will last for the duration of the current browser session. When disabled, the user will only ever see the same notification once, regardless of the browser session. When enabled, the notifications will be displayed in a random order rather than in a chronological order. When enabled, the notifications will remain on screen when they are hovered over. 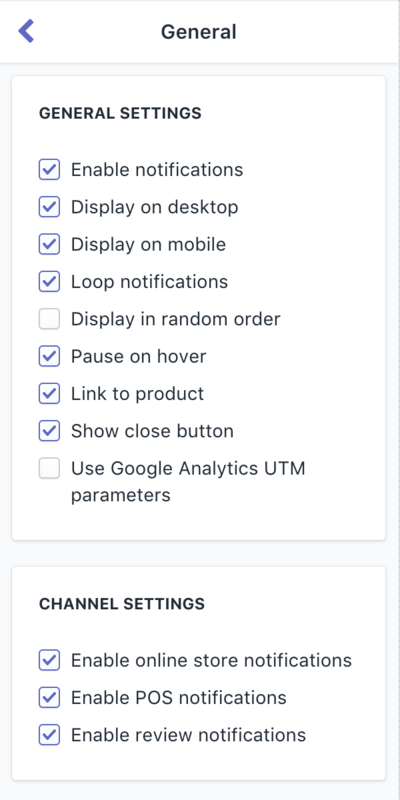 When enabled, the notifications will link to the product page if a notification is clicked or tapped. When enabled, a button to close the notifications will be displayed. When the close button is clicked, the notifications will remain closed until the end of the browser session. When enabled, sales from the online store will automatically be published to a notification. When enabled, sales from point of sale will automatically be published to a notification. When enabled, reviews from our supported integrations will be published to a notification.